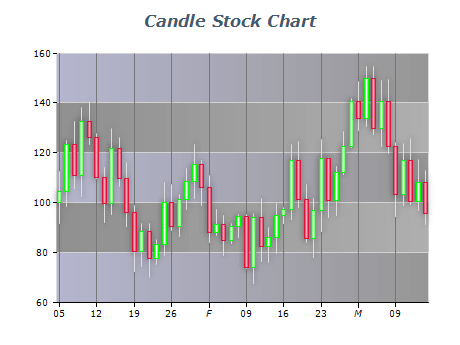 Candle charts are used to plot daily stock data. Each data point resembles a candle, where the candle body is formed by the open and close prices for the day. The high and low prices are displayed by vertical lines above and below the candle body. The body fill color depends on whether the stock price goes up (the closing price is higher than the opening price) or down (the closing price is lower than the opening price). Stick Charts are used to plot daily stock data. Unlike Candle Charts, Stick Charts do not draw a candle body. The open and close prices are marked by short horizontal lines, while the high-low range is presented as a single vertical line. The stroke style of a data point depends on whether the price goes up or down.